Yesterday, on the morning of the last day of winter, March 19, 2019, around 6:30 a.m., the minuet of the planets was on impressive display across the southern sky. Venus, nearly due east, was just clear of the horizon, still inching its way toward the sun and a coming period when it would be lost in the dawn’s glow. Saturn was arcing up into the east by southeastern sky, halfway up into the line of trees along our street, and bright Jupiter was brilliant in the southeast, nearly clear of the highest branchlets of the tallest elm. Admiring the progression, I drew with my extended arm the arching path of the ecliptic across the sky and found on the western horizon the approaching moonset of morning. I love seeing the morning sky unfold, the planets moving amongst the background of the Zodiac’s constellations, contemplating the way our Solar System is spread into a flattened oval racetrack of planets, nearly all spinning, like the Sun, counterclockwise (as viewed looking down from the earth’s north pole), all coursing in a clockwise path around the Sun, this dance shaped by and in honor of the conservation of the angular momentum of some five billion years of glittering, whirling evolution. Living in a large, well-lit city means losing sight of the stupendous night sky. I think something fundamentally wrong with our worldview comes with that absence. We no longer see ourselves as part of something so much bigger than we and our dazzling civilization. We no longer see ourselves and all we have built as minuscule specks in the midst of a seemingly infinite world; we and our lives become all too important, become foremost in importance. I grew up in a small town, back in the days when the dark was complete: black velvet, deep and light-absorbing, with stars that crystallized out of the depths of that absence of light, that sparked and glistened, that led you to believe you could never count them all. And in summer, our home galaxy arched up from the southern sky across the bowl of the heavens, waves of phosphorescence, stars and star systems dense with color and brightness. Small wonder that we spent so much time outdoors, our eyes directed skyward. Back when our son and daughter were in elementary and high school, we spent most of our summer vacations backpacking in various mountain ranges in the western United States. We loved to hike above tree line, and camping up there always left us awestruck at the immensity of the sky, at the unparalleled clarity. The whole night sky took on a three-dimensional feel. Those vacations were healing for many reasons, the night sky one of them. Our kids and their kids are now well along on their live’s trajectories. It has been many years since my wife and I experienced the night sky; with old age and infirmity and absent-mindedness we let things go, complained to one another about not having seen the stars for so long. The acceleration of our perception of time contributes to that feeling of something valuable escaping us, I believe, and we finally made our minds up to find a dark place and enjoy the sky, buoyed on by the prediction of clear skies (except for the smoke from the California fires), a recent new moon, and the waning days of the Perseid meteor showers. We drove thirty miles out of town, found a place to park (too close to the highway, but traffic was sparse enough that it worked out), and reclined on a blanket beneath the starry night. It was good for our souls. We gasped to one another about how magnificently the Milky Way wound its bright swath across the sky, identified barely remembered constellations and planets (Venus, Jupiter, Saturn and Mars were arrayed along the ecliptic like beads on a necklace), and felt how we are certainly all too finite (an idea acknowledged recently by an untimely death in the family), felt blessed that we could still take this all in through these old and less than perfect eyes. Here are two less than wonderful images I took with my camera. 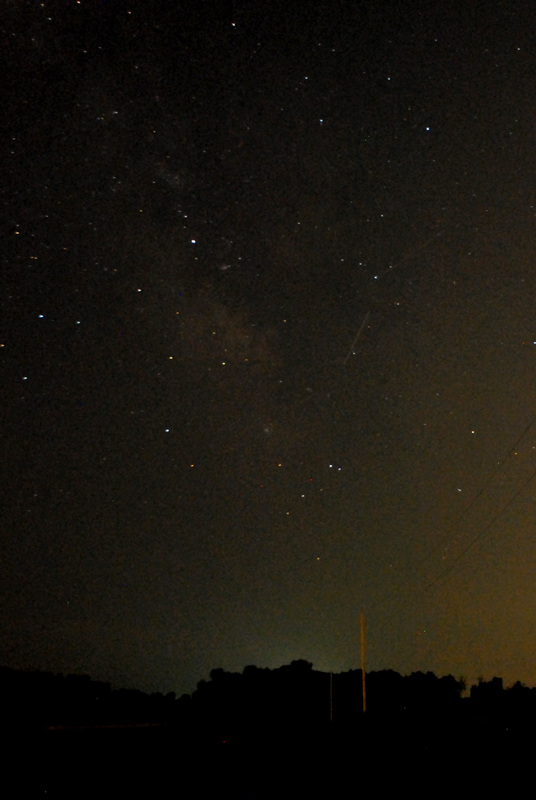 Both show the southern sky, the Milky Way. 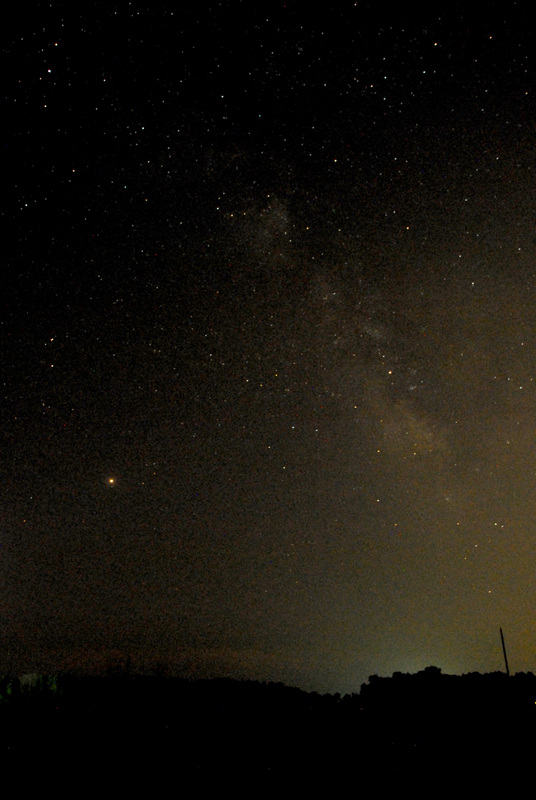 In the first, Mars is the bright spot of red light to the left. Saturn is visible over toward the right, a little higher in the sky than Mars, and located just at the right edge of the brightest patch of galactic light. The second is cropped in on a tighter portion of the sky, Mars out of view, Saturn now the brightest object visible, and there are two faint meteor tracks visible well over to the right of Saturn and nearly directly above the telephone pole. These, of course, do not capture reality very well. I only hope that they inspire you to stay up late some night soon, drive out beyond the lights of your city, town, or homestead, park, find a grassy spot to loll on and recapture your childlike awe at the wonder of skies scattered with stars. I have always loved words that are rich in sound and texture, words that resonate, that contain in themselves some raw element of their meaning, unusual words that add spice to a poem. I keep a list of them in my notebook and look at them every so often for inspiration. Of course, they can be overdone, unless used by a master like Albert Goldbarth. So for the rest of us mortals, it is wise to use them sparingly, in simple, short poems at first, where they can stand out without overshadowing. So, here’s an example. Titled “God rode by,” it is a short poem I wrote and first recited at a jazz/poetry reading where a jazz combo improvised around the poet’s words. Not sure about the poem’s origins, but as a kid I repainted my bike every spring. I would go to the hardware store, buy a small can of some appealing color, brush it on, oil up the chain, and the next day I would be off riding toward adventure on a spiffy new steed. Two words in this poem were taken from my list of Special Words: redolent and Baroque. I had used Baroque before. It is an adjective meaning “of, relating to, or having the characteristics of a style of artistic expression prevalent especially in the 17th century” (Merriam-Webster). So it is fairly easy to use and fairly straight-forward for the reader to interpret. Redolent is just a lovely word. It starts out with you pursing your lips (“reh”), touching your tongue on the roof of your mouth for that hard “d,” pouring that “oh” out over your tongue, then rolling it and “len” around, then your tongue goes to the roof of your mouth again for the more sprightly “tuh” at the end. Its primary meanings relate to exuding a fragrance or aroma; I used it in terms of its secondary meaning, “conveying an aura,” “tending to suggest,” or “evocative” (Merriam-Webster again). “Nice paint job!” I called. This poem begins with the preposterous and presuming image of God coming by my yard on a bicycle. I then make sure that things are a bit more serious by setting his choice of colors on a more celestial scale. Notice that the line “redolent of Baroque oils,” can actually be read as relating to aroma, especially if you have ever painted with oils; it brings to mind the mellow odor of linseed oil rather than the sharp smell of the turpentine that would be used to thin the kind of enamels you would use for a bike. I went on to elaborate on the imagery, referring to a specific painting by a Baroque artist, and added what I hope is a touch of humor in that the painting is titled The Penitent Magdalene (since she was a central figure in Christ’s life). I then took a turn back to the ordinary, taking it on myself to congratulate Him on the bike’s appearance, then noting again at the end that He has, even in these ordinary endeavors, extraordinary abilities. 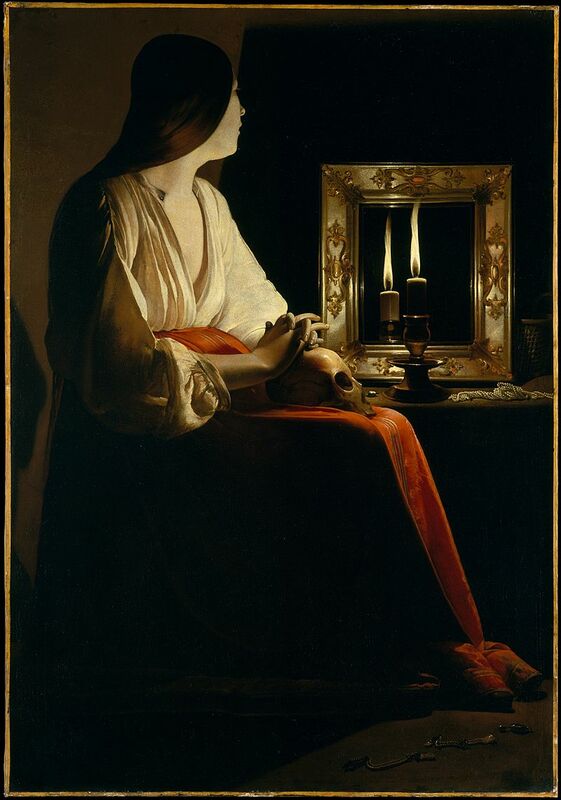 Here’s an image of de la Tour’s The Penitent Magdalene (click on the image for an enlarged view). The painting can be seen at the Metropolitan Museum of Art in New York City. My good friend Dan Pohl teaches English at Hutchinson Community College and writes delightful poetry. He also knows how to truly own a book of someone else’s poems. 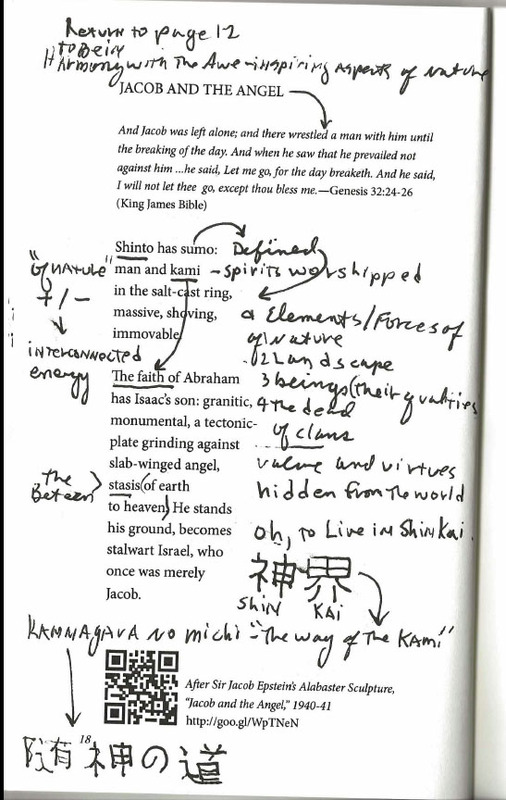 I first got to know how Dan approaches a new book of poetry when he showed me his heavily annotated copy of my first book, Music I Once Could Dance To (Coal City Press, 2014). Dan reads with a pen and notebook, usually in a deck chair or comfortable easy chair, tea or coffee at hand. And he really digs into each poem, Thinks about it, underlines words and phrases that catch his attention, adds little notes and side comments and does research on unfamiliar names or places. He finds things in poems that have meaning to him and jots them down, there on the page. I always like to see what he writes about my poems, as I find it fascinating what other people take from my poems. Some of it I knew was there, other things I might never have seen or suspected. So I gain insight into my writing that I can’t get any other way. As a result of seeing how Dan approaches reading, I have been trying to up my game and get much more involved when I approach others’ poetry. I have a long way to go before I get as good at this as Dan; he has had a lot of history and experience at this. I can’t yet formulate how to do this: it involves a bit of critique, a bit of free association, a bit of self-psychoanalysis, I suppose, and definitely a deep background of reading widely and voraciously. Rather than try to explain the process, I prefer to illustrate it with a few examples of how my poems look on the page after Dan has read them. These examples are from my latest book of poetry, Amanuensis Angel (Spartan Press, 2018), which contains ekphrastic poems inspired by abstract and other artists’ depictions of angels. This is the first poem in the book, “Angel of Chaos.” It was inspired by a Salvador Dali painting. This poem, “Jacob and the Angel,” was inspired by Sir Jacob Epstein’s sculpture depicting a scene from Genesis, Jacob wrestling with an Angel. Epstein’s figures were massive, and reminded me of sumo wrestlers, so I keyed off them. Look these over, and note how Dan goes off at times to wherever the words or images lead him. To Japanese characters, sketches. He notes questions that arise when he reads, makes his own interpretations. 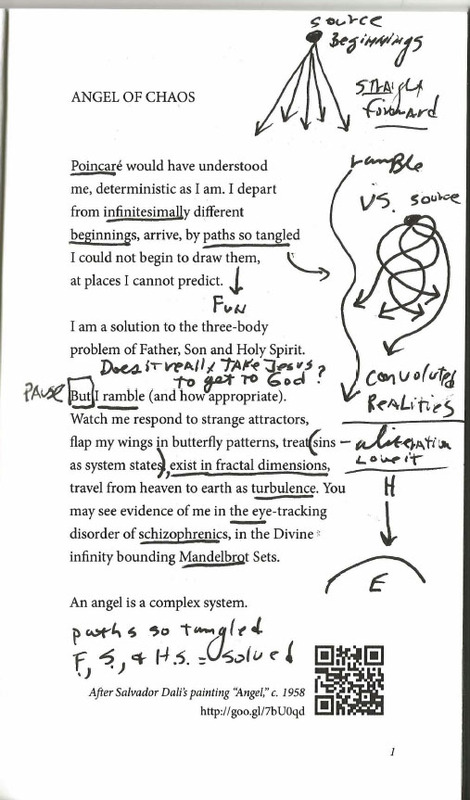 I hope these few examples will inspire you to grab a pen or pencil from your desk and a poetry book from your shelf and own someone’s poems using Dan Pohl’s marvelous annotation techniques. Stephen Hawkings passed early in the morning of March 14th, 2018, at the age of 76. Here is my poem, “Cerebellum’s Fire,” from 2016. It won the overall poetry prize in the Kansas Voices competition that year. It is my small contribution to honoring Hawkings. the first true man none of us remembers. that sparked Genghis Khan’s ambitious brain. bare and bold, and not the mystery it seemed. sees how the world was born and how it ends. In a previous edition of this blog back in 2016, I list poems and creative writing of mine posted in online venues through May 2016. In this post, I provide links to work published between then and now. In Volume 1, Issue 3 of Chrysalis: The Journal of Transformative Language Arts: My essay, “Coping Through Connections: Faith, Rationality, and Poetry,” about the process of writing my poem, “Rosarium Threnody,” which appeared in the Spring 2016 issue of the print journal Dappled Things. In the online journal River City Poetry: Three poems in the Summer Sampler Issue: “Night Sounds, “Pretense,” and “Mayflies Rise.” A July 1, 2017 review of Jason Baldinger’s chapbook Fumbles Revelations, and a July 13, 2017 review of Tyler Robert Sheldon’s chapbook First Breaths of Arrival. cracked as if by thunderclap. are only all too human. 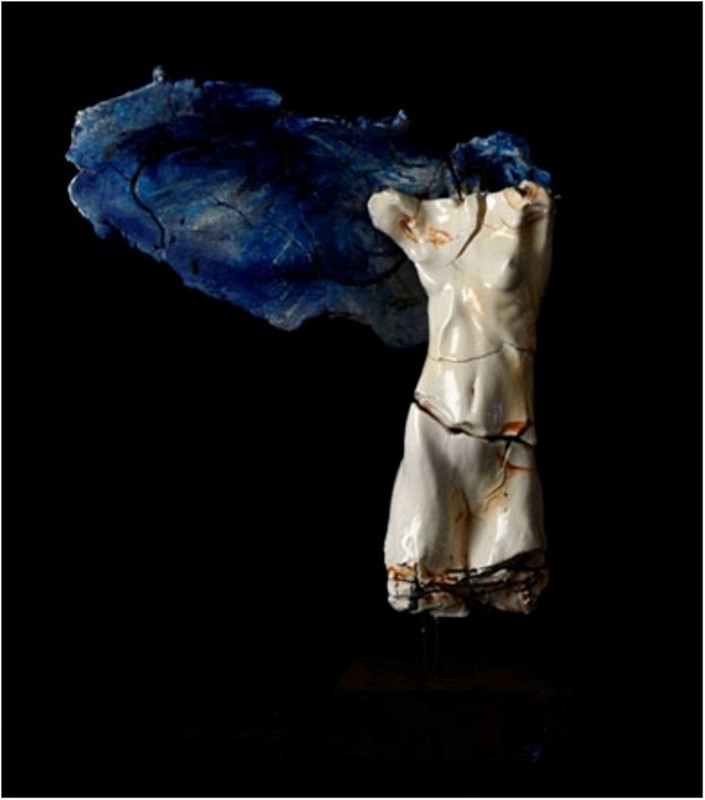 Artist Carl Dahl’s work may be found on his Website. “Benevolent Angel” is one of a series of ekphrastic poems written in response to depictions of angels by artists. The poetry collection forthcoming as Amanuensis Angel, 2018, Spartan Press. 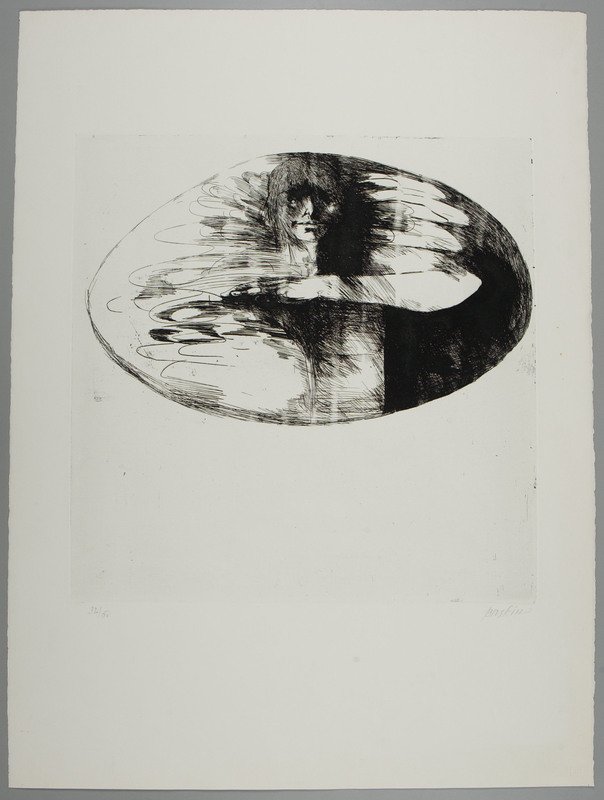 Image of Leonard Baskin’s etching, “Benevolent Angel,” provided by and used with permission of Harvard Art Museums/Fogg Museum, Gift of Mrs. John M. Schlein © Leonard Baskin Estate, Courtesy Galerie St. Etienne. Just in time for holiday gifting. Get yours now. “Type O, Premature,” features original textile art by Malissa Long Wilson. 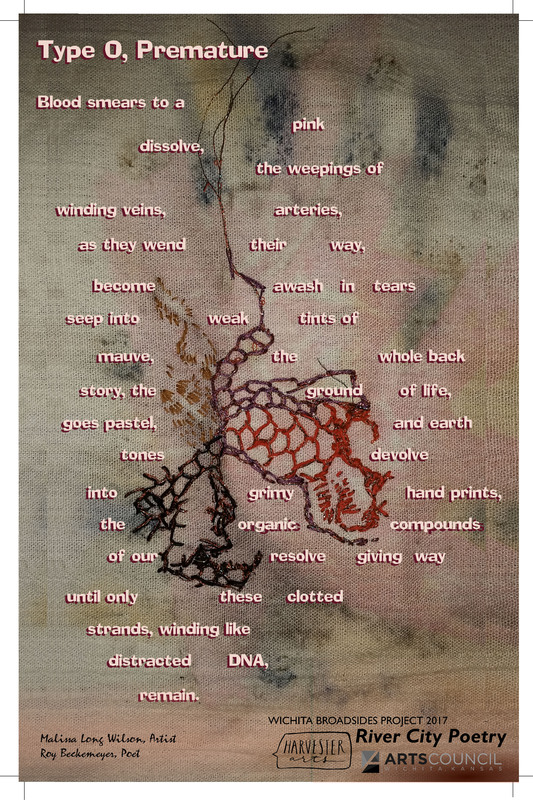 My poem was written as an ekphrastic piece inspired by her artwork. The image seemed to me to be very organic and put me in mind of the tragedy of miscarriage. After I sent her the poem, Malissa shared with me that the piece was one she did during her recovery from cancer. We hope you find this broadside as emotionally charged as we did.